I would like to welcome you to my showroom which is located in a beautiful country setting in our Georgian property. 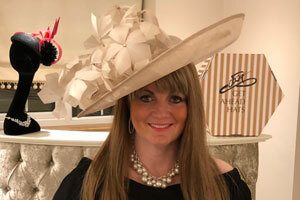 Here you will find a friendly and relaxed atmosphere with hundreds of designer hats, perchers and fascinators from British milliners, straight from the catwalks to hire or to buy. Different styles and colours together with beautiful accessories to create that perfect look for your special occasion. From one off Couture pieces, lavish and extravagant to timeless classics. Or maybe have something individually made to your requirements. There is something for every taste and budget. Appointment times are entirely flexible, please telephone or email me so we can arrange a private consultation at your convenience. Do bring your outfit with you, we have excellent changing facilities. From the A483 take the B5426 signed Bangor On Dee. Pass through the small village of Eyton, proceed through the traffic calming, turning right on the bend immediately after the farm shop. Get Ahead Hats is situated 100 mts down the lane, follow the signs.